I like to Blog it Blog it: Who selected Simi? There's a new show on TV. New = a month old. Now normally I would've written about it the day after the first show. But, why did I wait so long? I just needed to let it all settle in. And have a couple of limeshots to digest Simi Garewal with her 'Can you guess my age' wrinkle free face dressed in all white while juggling between playing the roles of intrusive therapist, concerned but annoying friend and a flirty 16 year old named Kiki to name a few. 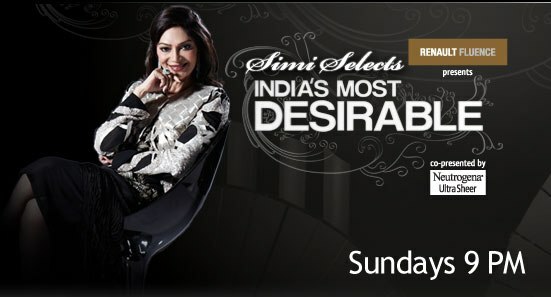 The show is called Simi Selects India's Most Desirable. Who let the Simi out? Trying hard to compete with other (successful) talk shows, Simi tried to jump the shark and returned after many years on this new show with an all new avatar. Or so she thought. It all starts with let's talk about everything that's you. Simi calls it Personality Café. 5 minutes later the show turns into let's talk about your love life and when you're getting married. Then comes the parents segment. So, this is not even a real segment. The parents just seem to pop by every now and then out of nowhere like the Great Gazoo and give their opinions on every question that is asked to their celebrity child. Sometimes you wonder if they're hiding backstage. How could they pre-record and be ready for every possible question and answer. After this comes the talk (police interrogation) about their partner/ ex-partner, have their parents comment on their partner/ ex-partner or just who they think is good looking (like we care). Then comes the part where the celebrity can show off a skill. This could range from making food, drinks to even singing or dancing. Wow, now those are some serious talents (not). And then we move onto the Tarot segment. A little rotating wall reveals a Tarot card reader with a table, cards and a wall with a spacey design et al. Festive! The super smart tarot card reader pretty much tells us what we've already read about the celebrity in Bombay Times/ exactly what you wish to hear so everyone can go home smiling. And if they don't have questions, not to worry, Simiji (yes, people seriously call her that) has a whole bunch ready. I think she was called Simi Aunty by some of the young celebs (star kids who grew up playing in her garden) but then probably said Aunty mut kaho na and got away with a respectful ji. Lady Simi then gives you a well edited sneak peek into next week's episode that basically tries to trick you into believing that the celebrity said something that's not politically correct. Hoping to get an Oh my God or Haw reaction. Then we have The Minefield - a Q & A segment where the celebrity is asked questions they really don't want to answer. Dodging her questions somehow seems more difficult than dodging mines and if you don't answer, the question is simply rephrased and asked again in a very 'concerned' tone. Simi then tries to make it interesting by playing a game that people who are a quarter of her age love to play - Never have I ever - which she twists into I Have Never. It's normally played as a drinking game. And honestly whenever I have played it, I have lied. Unless I was just very 'thirsty' that day. With no alcohol involved, and nothing stopping the celebrities from lying, it's just another pointless segment. And then we return to watch the annoying audience be dangerously intrusive and bore us with more questions in a segment called Truth Bucket - which is when you wish someone would just tell them it's none of their business. If they don't answer the penalty is a hug. Original. You can totally see how the boys purposely ask inappropriate questions just to get a hug from a hot celebrity. Eeks. And one lucky questioner gets a Neutrogena hamper that has been signed by the celebrity guest. I dont know what the excitement is all about. It's Neutrogena not Apple. And then it all comes to an end. No, not the world. Just the show. The celebrity draws a self portrait in less than a minute. No, it's not a game. It's just because they really don't care. Simi auctions the artwork (on the net). The common man (me etc) is supposed to bid for it and the proceeds go to charity. Finally the celebrity leaves with a really big weird trophy which I'm sure they wouldn't be keeping in their living room since being on her show isn't exactly an achievement. Will I watch it next week? I'm a mean girl who loves giving mean comments while watching TV and eating junk food. I'm bored of bitching so let' make it quick and painless. Ranbir Kapoor: Not fooling anyone. Neetu Singh (not a guest but had as much face-time as Ranbir on the show): Mother obsessed with her Aankhon ka taara. Deepika Padukone: I like her so I won't be mean. Siddhartha Mallya: Surprisingly likeable. Love his confidence. Sonakshi Sinha: For an actress who is in her twenties, she has a curfew? And cries if her father cuts himself while shaving? John Abraham: I didn't really watch this one. I was busy focusing on whether his arm is bigger than my face. Plus he pronounces prayer as pray-year. Sonam Kapoor: Refreshing and honest. Advice to Simi: Spend a day with Graham Norton (love him). Learn a thing or two about creating a fun show. Tip: Note the undertones of sarcasm in this blogpost for full effect. Even I enjoy 1 hour of cringing on Sunday nights.